Teaching With Love and Laughter: Who loves to write? Children love to write, right? I know my students do! They love to write stories and lists and words and sentences. It doesn't always make sense and I can't always read it, but as long as they can read it to me, I'm happy! This past week, I asked my students what they would like for me to make for them. They know I create many of their activities myself and I love to get their input. They told me to make some write the room activities. They wanted to write words and be able to draw pictures to go along with them. They wanted to write a shopping list and practice writing number words. Ask and you shall receive! 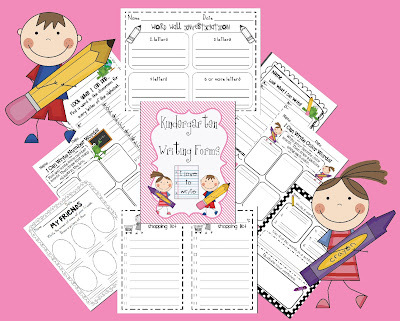 I put together a packet of 8 different writing activities. Some of the activities have been around the block, some are new ideas. All of them are really cute, though! Cute fonts, cute clip art, cute borders. Please check it out if you are tired of your own write the room activities. If you like it, please let me know. I LOVE feedback! Thanks for looking! 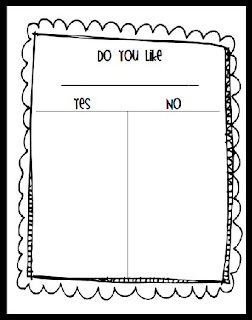 Don't forget to download my freebie, Do You Like? It is also a great writing activity. My students cannot get enough of this one! One more thing! I'm trying REALLY hard to reach my selling goal for this quarter. I'm just a wee bit short! If you were thinking of purchasing something from my store but haven't yet, may I please beg you to do so before the quarter ends? Yes, that is tomorrow! I know! But, I thought I'd give it a try! If you read my last post, there's something in it for you if do! Thanks so very much! Thank you so much for following me on my blog. Being new at this, it was exciting to see a follower. I really appreciate your support. You have an awesome sight, that I am now following, and I am headed to your TPT store next. Thanks again, and I will be checking back often. Thanks, Sandra! 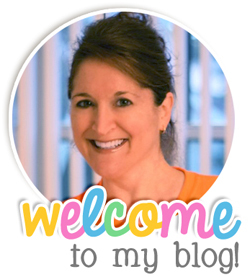 Welcome to the addictive world of blogging. Let me know if you have any questions. I'll be happy to help you!